There are too many toll systems in the U.S. E-Z Pass is good from Illinois east to Massachusetts and South through Washington D.C. Clearly this is the largest system and having a E-Z Pass already I didn't have to do anything. Florida's Sun Pass tolls was the most confusing. You can get on a FL toll road and end up having to pay a toll with coin and there you sit at the toll gate looking for change not being prepared. I went out and got a Sun Pass at CVS and it only confirmed tolls twice. The rest of the time I drove through and I gather it didn't work. They threaten to send a bill to your address and none came. I was wondering if they only had rear cameras and with my bicycle off the back it couldn't read my plate. I don't care. It's a messed up system to say the least. In Oaklahoma I avoided the toll road from Tulsa to Missiouri except for the last 20 miles. I got tired of RT 66 and on to the toll road and encountered a toll booth that required $.75 for entry going east. They have a pass system but also collect money. My list can go on but the point is that when traveling across the country using interstate roads you run into toll roads and some give tickets or passes, others have passes, envelopes to keep track of the amount for each toll and mail the money in, others want money but you have no way of knowing the amount in advance. The toll systems in the US are messed up. Some interstate roads have tolls and others don't. I didn't even know that OK had toll roads until just as I was at the road. In FL it was worse as you get on the toll road and there was no sign to opt out of getting on the road if you didn't want to be on it. I'm glad that most of my travels take me in one system (E-Z Pass) and you don't have to deal with the various systems that are out there. In my view Interstates shouldn't even be toll roads. 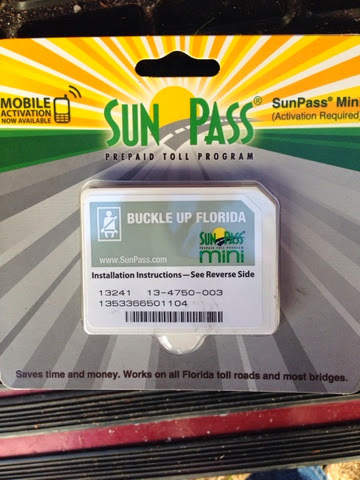 SunPass is a giant waste of money for tourists!!!! Shame on the state of Florida for MAKING you buy a stinkin' pass, and then put on a certain amount of money from your credit card. And if you don't spend all that money?? Then what?